Do you have piles and piles of local zucchini yet? It might be a little early for you Northerners, store but we’re nearing the end of our zucchini growing season and that means zucchini bread, zucchini pasta, zucchini frittatas… You get the idea. Everyone’s looking for new zucchini recipes. Last year I made Zucchini, White Bean and Leek soup. That’s still a favorite around here, especially when I want some soup with a little bit of heft. But what if I want a lighter soup? Something that can be sipped from a cup and paired with a salad or sandwich. Less of a meal soup and more of an appetizer soup. 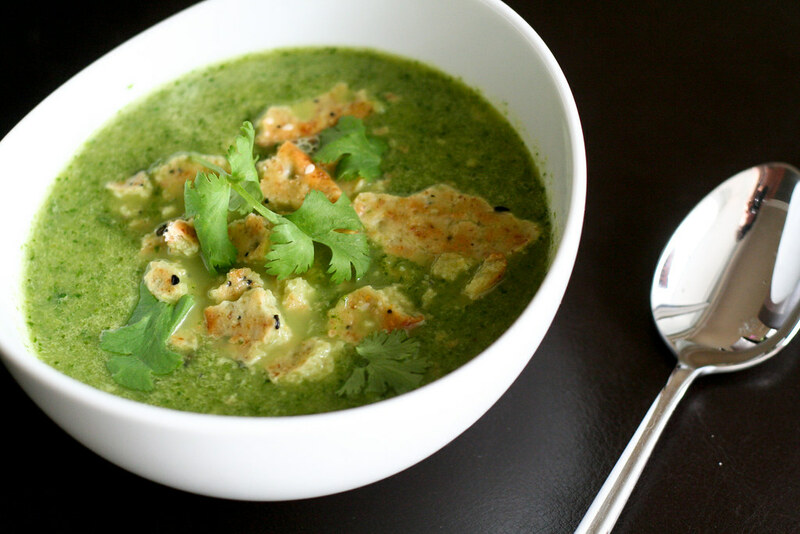 This Green Curry soup is just that. It’s got a definite Thai influence with coconut milk and green curry paste. It also has a lot of fresh green spinach and zucchini to make it taste like the garden (or the CSA box). If you don’t yet have an abundance of zucchini, bookmark this recipe. I guarantee that by August you’ll be looking for new ways to get through your hoard. Place a pot over medium heat. Once it’s hot, heat the olive oil, then add the onions. Cook the onions until the start to become translucent – about 5 minutes. Add the zucchini and cook until just tender – an additional five minutes. Add the spinach and the chicken broth and bring to a slight simmer. Remove a few spoonfuls of the broth into a small bowl then add the curry paste to the bowl. Stir until the paste is loose and smooth, then add it back to the pot. Remove from heat and stir in the coconut milk. Using an immersion blender, food processor or blender, carefully puree the soup until very smooth. Taste and add the salt according to taste. Ladle into bowls and top with croutons, crushed crackers and/or fresh cilantro leaves. WOW – what a fantastic soup! Gorgeous color, and I love the flavor combo. We’re not knee-deep in zucchini yet, but I am bookmarking this for a few weeks from now! 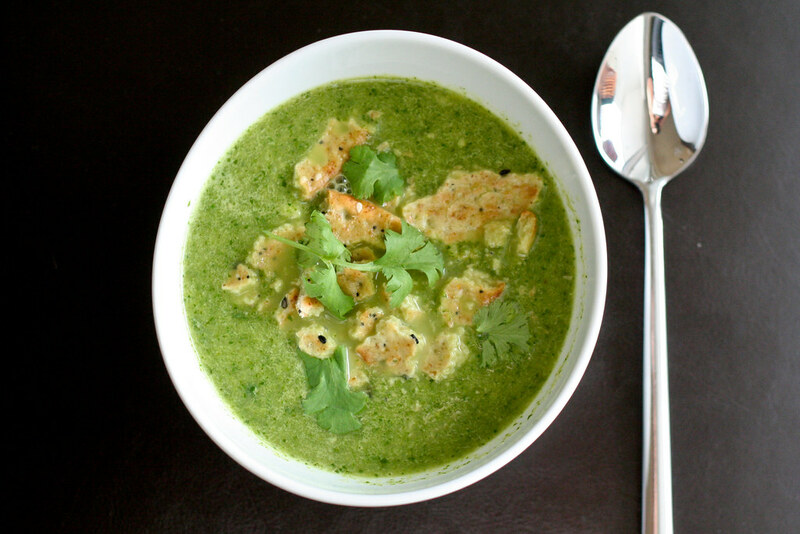 Green Curry and Coconut milk are a tough combo to beat! Looking forward to giving this one a try. The zucchini is just starting to pour in by the buckets here…99 cents a pound at whole foods. Stellar. I have some in the fridge and this is SO going to be made! This looks delicious! I may just go to the store after I leave work (Summer Friday, F’yeah!) to pick up the ingredients and make this! Great looking soup and so unique. I no longer grow zucchini and have the need to find dishes for it…but this dish is still a great find! BTW; when I had an overabundance from my garden; I found that I could grate and freeze in two cup quantities…no blanching required…and use for breads and muffins in the winter too! i love all of your recipes. this one was quite simple and spicy (curry paste)… good for an app or first dish, not substantial enough for a meal. I added a bit of thyme and used shallots instead of the onion, as well as a spoonful of cottage cheese just before serving.